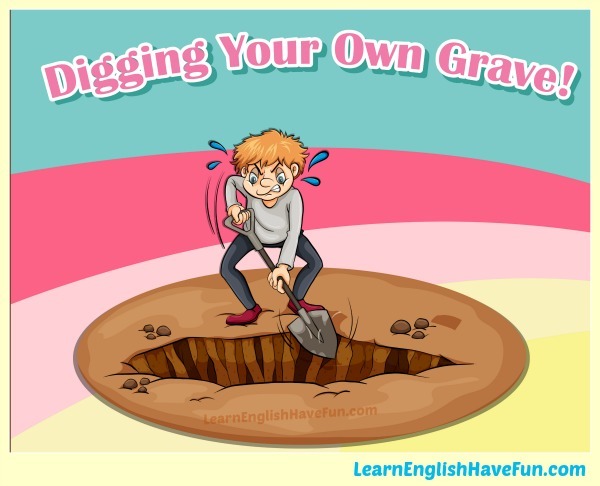 Try to guess the meaning of the idiom 'dig your own grave' by looking at the picture. Dig your own grave: doing something that will cause you to have problems in the future. A grave is a place where a dead body is buried (usually in a hole in the ground). The man in the picture above is using a shovel to dig a hole in the ground for his grave. If you're digging you're own grave, you're creating the place to bury your own dead body. The idiom doesn't go as far as saying that you're killing yourself, but it's used to highlight something that is going to cause you a big or significant problem (not a tiny mistake). I hope you know you're digging you own grave by continuing to smoke a pack of cigarettes every day. My son dug his own grave by cheating on his exams. If Sally continues to use her credit cards recklessly, she'll eventually dig her own grave. We dug our own grave when we pulled all of our money out of savings to invest in our grandson's business. It failed 18 months later and we lost every penny. Spending all of your time with your boyfriend rather than studying is digging your own grave. I know I'm digging my own grave working so much but the law firm expects us to put in a lot of overtime. A lot of young people dig their own graves using social media because they don't know that prospective employers can find many of the things they post. I guess I dug my own grave when I told my professor to "F*&%! off" in front of the entire class. You're digging your own grave by sneaking out of the office early each day. One day someone is going to notice! People know they're digging their own graves by eating junk food and not exercising but they're to lazy to change their bad habits. Smoking pot is one thing but doing heroin? Dude, you're an idiot and you're digging your own grave! I dug my own grave by skipping so many classes this semester. We knew we were digging our own graves when we started charging every little thing on our credit cards but at the time we didn't think that we had any other choice. If you found this idiom useful, sign-up for my free newsletter to learn when I add new idioms. You'll also you'll find out about other updates to my website and get new contest notifications. Practice your English by writing an example sentence in the comments box below. It will really help you to remember this idiom in the future if you write your own example in a notebook.